9.11.1904: Launched by Cook, Welton & Gemmell Ltd, Beverley (Yd.No.62) for Alick Black (32/64) and Walter Olney (32/64) both Grimsby as KINGSWAY. 13.1.1905: Registered at Grimsby (GY37). 13.1.1905: Alick Black designated managing owner. 25.2.1905: Alick Black shares (32/64) and Walter Olney shares (32/64) mortgaged to The Lincoln & Lindsey Banking Co Ltd, Lincoln. (A) & (B) respectively. 31.1.1907: Alick Black shares (32/64) mortgaged to The Union of London & Smith’s Bank Ltd, Grimsby (C). 9.9.1908: Mortgage (C) discharged. 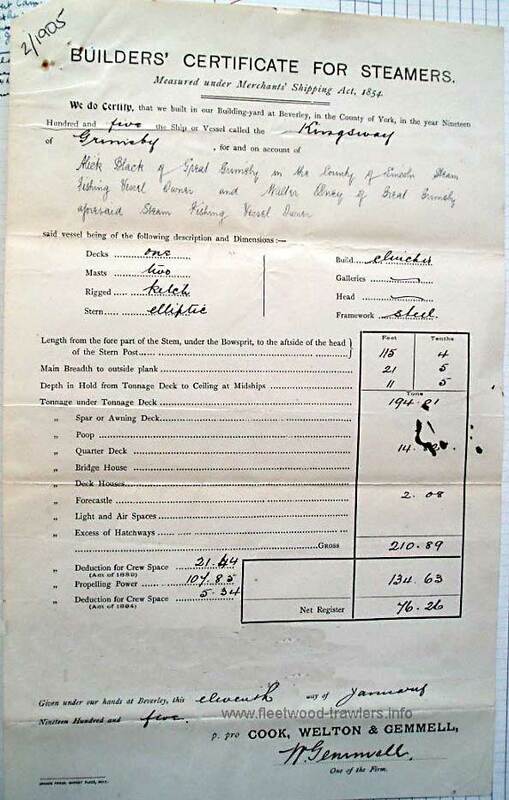 9.9.1908: Alick Black shares (32/64) sold to Alfred William Baxter (32/64), Grimsby. 9.9.1908: Alfred William Baxter shares (32/64) mortgaged to The Union of London & Smith’s Bank Ltd, Grimsby (D). 11.8.1908: Alick Black appointed manager. 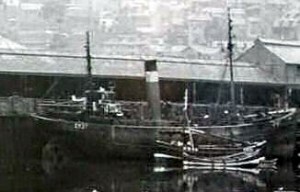 24.5.1909: Walter Olney shares (16/64) sold to Albert John Wright (16/64), Grimsby. 24.5.1909: Walter Olney shares (16/64) sold to John Lawrance Green (16/64), Grimsby. 8.6.1909: Albert John Wright shares (16/64) mortgaged to The Union of London & Smith’s Bank Ltd, Grimsby (E). 12.6.1909: Alick Black appointed manager. 18.5.1910: Alfred William Baxter shares (16/64) sold to John Edgar Harrison (16/64), Grimsby. 18.5.1910: John Edgar Harrison shares (16/64) mortgaged to The Union of London & Smith’s Bank Ltd, London (F). 1.6.1910: John Lawrance Green shares (16/64) mortgaged to Stamford, Spalding & Boston Banking Co Ltd, Stamford (G). 14.6.1910: Alfred William Baxter shares (16/64) mortgaged to The Union of London & Smith’s Bank Ltd, London (H). 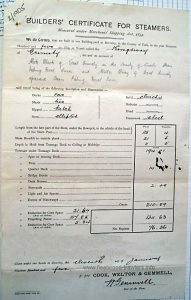 10.11.1911: Mortgage (G) discharged (Stamford, Spalding & Boston Banking Co Ltd in liquidation). 10.11.1911: John Lawrance Green shares (16/64) sold to Alick Black (16/64), Grimsby. 5.12.1911: Alick Black shares (16/64) mortgaged to The Union of London & Smith’s Bank Ltd, London (I). 14.7.1912: Alick Black designated managing owner. 26.2.1913: Alfred William Baxter shares (16/64) sold to Alick Black (32/64), Grimsby. 28.2.1913: Alick Black shares (32/64) mortgaged to The Union of London & Smith’s Bank Ltd, London (J). 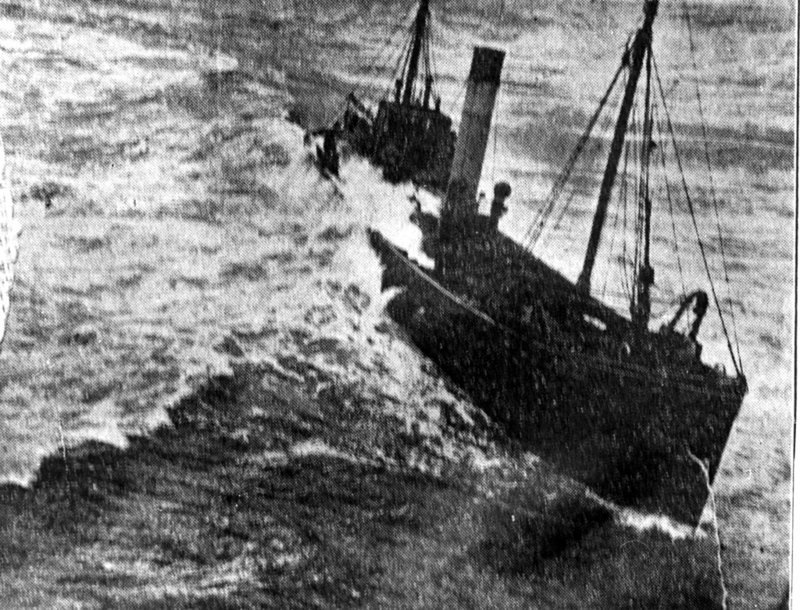 1.1.1914: Tonnage altered to 82.85 net under provision of Merchant Shipping Act 1907. 1.4.1914: Mortgages (E0, (F) & (J) discharged. 2.4.1914: John Edgar Harrison shares (16/64) and Alick Black shares (32/64) sold to The Strand Steam Fishing Co Ltd (48/64), Grimsby. 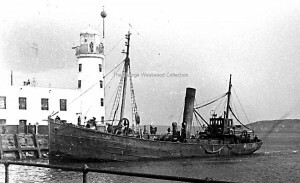 8.4.1914: Albert John Wright shares (16/64) sold to The Strand Steam Fishing Co Ltd (64/64), Grimsby. 8.4.1914: Henry Croft Baker appointed manager. 8.4.1914: Vessel mortgaged (64/64) to The National Provincial Bank of England Ltd, London (K). 8.4.1914: Mortgagee (K) re-styled The National Provincial & Union Bank of England Ltd, London. 12.1914: Requisitioned for war service as a boom defence trawler (1-3pdr). Based Kirkwall. 15.2.1924: Mortgagee (K) re-styled National Provincial Bank Ltd, London. 28.10.1929: Sold to Samuel Chapman Snr, Samuel Chapman Jnr, Fred Chapman and Benjamin Chapman all Grimsby (64/64 joint owners). 4.11.1929: Samuel Chapman Jnr designated managing owner. 20.4.1931: Sold to Charles Dobson (64/64), Grimsby. 28.9.1932: Charles Dobson designated managing owner. 29.9.1937: Vessel mortgaged (64/64) to Midland Bank Ltd, London (L). 27.11.1939: Requisitioned for war service as a minesweeper (Hire rate £52.15.0d/month). 5.2.1940: Returned to owner at Grimsby. 26.3.1941: When some 10 miles E of Bell Rock, bombed and damaged by German aircraft. 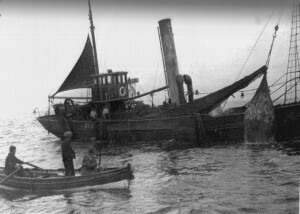 24.12.1941: Sold to The City Steam Fishing Co Ltd (64/64), Hull. 7.1.1942: Leslie James Marr, Thornton-le-Fylde appointed manager. 1942/3: Occasional landings at Fleetwood from Iceland grounds. 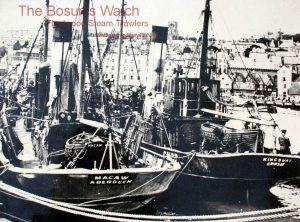 26.6.1943: Typical landing, 790 boxes – 50 cod, 550 haddock, 50 flats, 100 coley, 20 cats, 20 bream. 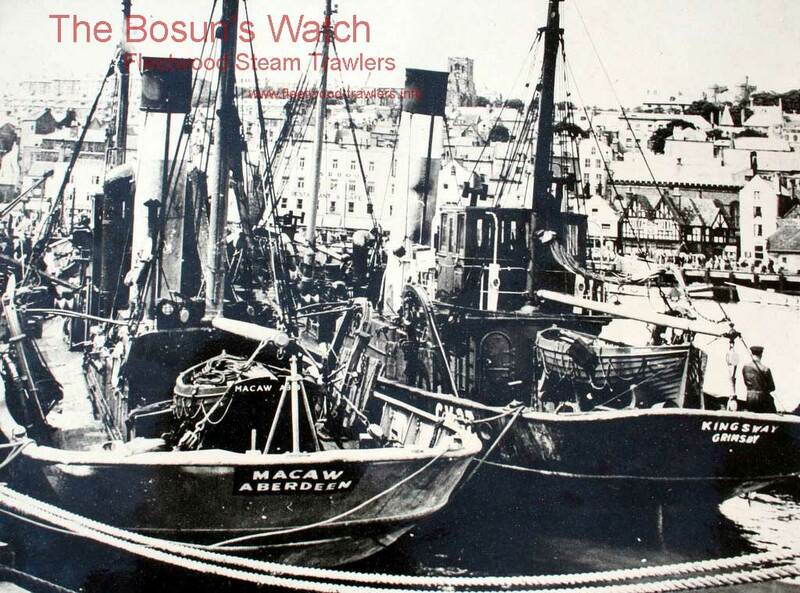 22.9.1943: Sold to Richard Cammish, Robert Cammish, Matthew Cammish all Filey and Sk. James Heritage, Scarborough (64/64 joint owners). 1.10.1943: Richard Cammish Jnr designated managing owner. 7.12.1950: Richard Cammish, Robert Cammish and Matthew Cammish (64/64 joint owners). 17.1.1951: Richard Cammish, Scarborough appointed manager. Last skipper Jim “Batn’er down” Crawford. 5.1954: Sold to BISCO and allocated to J. J. King & Co Ltd, Gateshead for breaking up. 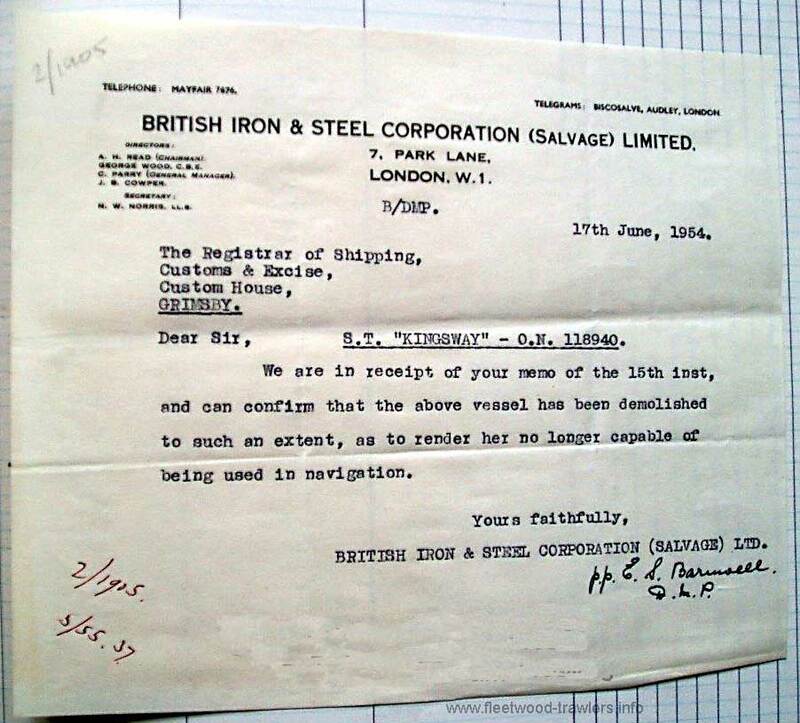 18.6.1954: Grimsby registry closed. “Vessel broken up, …”. 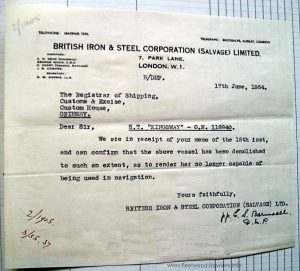 See memo from BISCO (Salvage) Ltd dated 17.6.1954. 07/04/2016: Significant information update. 2 certificate pictures added. This entry was posted in Steam Trawlers, Steamers (Picture) on November 1, 2015 by Fred Smith.